Always wondered why anyone would get on an open-air bus when the aircon ones are just a few baht more expensive - then you realise that the people using them are the absolute lowest earners and a few baht everyday makes a huge difference. I had the misfortune of using one when it was raining. It was like being in a polluted sauna. Never again. "“Buses in poor condition will be sold and their components recycled"
I wonder where these old components will be recycled - in the Inter City buses???? Dumped in Isan. Adding to the fleet. Sounds like they've sucked in the climate change propaganda along with the city's notoriously severe air pollution - which is a far better reason to roll out a new, air-conditioned fleet. 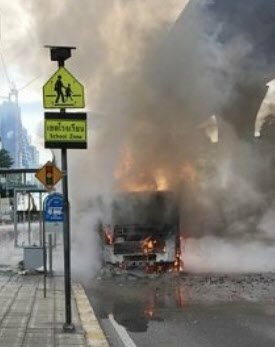 The sad thing is, in the past year or so, the BMTA has had a couple of its air con buses burst into flames while carrying passengers on the road, two I can think of on Sukhumvit Road in recent memory... I think due to their fuel systems..... The old ones, they just eventually get crashed and die! The BMTA imposed the maximum fine of Bt5,000 on Pornpin Transport and removed the problematic bus from the list of vehicles qualified to provide transport services. Was there any way they were going to keep the bus in service after this??? The bus is way to complicated for my small brain, so I use it to roll up and down main roads if necessary. Sometimes im just not in the mood to walk that last 2 miles. PS the Skytrain is great! Open air buses indeed! What a load of crap! Call them for what they are. Smoke belching rattletraps held together with rivets and bodyfiller with drivers who think they are on the Le mans race track and get great enjoyment out of throwing standing passengers around like rag dolls as they swerve between lanes at break-neck speeds. They are cheap and get you to where you want to go.......but! Believe me they will still be on the streets of Bangkok for a lot longer than 2022. Thai greed will make sure of that. I used to ride those from my house at Pratunam to the US Embassy when I worked there. 40 years ago, air con buses were scarce.